Preheat oven to 150°C. Take black peppercorns, sea salt, garlic, rosemary and Kashmiri red chilli powder in a mortar and pound with a pestle. Clean the chicken well. Starting from the neck cavity, loosen skin from breasts and drumsticks by inserting fingers gently between skin and flesh. 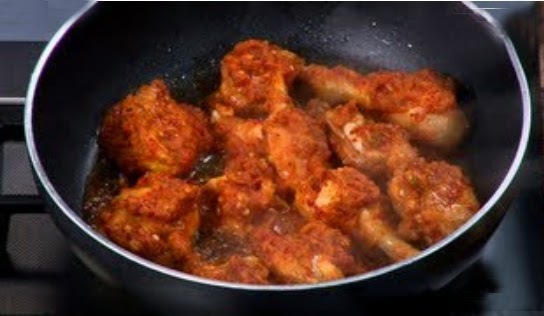 Rub the prepared spice mixture under loosened skin of breasts and drumsticks and put the remaining mixture into the cavity. Tuck in the legs and set aside for fifteen minutes.Heat two tablespoons of oil in a pan. Place the chicken in it and sear the chicken on both sides on high heat. Put carrot, onions, celery and leeks in the baking tray. Add bay leaves and salt and drizzle the remaining oil. Pour one cup of orange juice.Place the chicken over the vegetables in the tray. Cover with aluminium foil and place the tray in the preheated oven. Roast at 150°C for two and a half hours.Remove the foil and transfer the chicken into a serving dish. Pour the vegetables and pan gravy all around it and serve.